We specialize in and take pride in offering web site maintenance services. Too many web developers build the site and are then hard to contact for support after the site goes live. We always answer the phone or emails. We have a fast turnaround time and work accurately to meet your schedule. Often, our clients don't have the time or writing experience to craft good copy for their web pages. We'll interview you, determine what content should go on each page, collect information as needed from your staff, and write professional copy that attracts and informs customers. These days, many people spend as much or more time searching the web on mobile devices as they do on desktop monitors or laptops. The last thing they want to do is spend a lot of time scrolling to get see an image or to read text that extends beyond the screen width. We can design or reconfigure your website to look great and function properly on tablets and mobile phones of any screen dimensions - just the way this site does! Read more about responsive / mobile web design services. According to San Francisco Bay Area lore, there is never a moment when some part of the Golden Gate Bridge is not undergoing a paint job. A Web site works the same way: Once you finish it, technology has improved and your needs have changed. The key is to redesign a site that's as up-to-date as you can manage and flexible enough to accommodate change. If your web site is not delivering customers to you, give us a call. 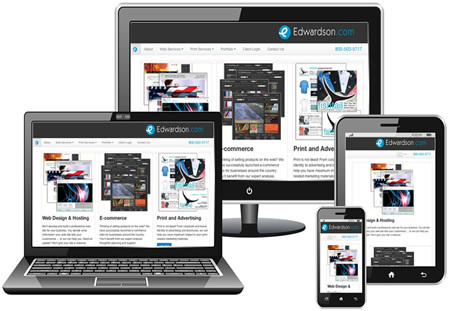 Edwardson.com has a reputation for delivering results.